ALL OPEN SOURCE. Editing my blog post on WordPress, a powerful open source content management system, in my Ubuntu Linux workstation. The warnings come even as PAPT found rural banks, universities and hospitals using unlicensed software in a recent series of raids in Iloilo City. PAPT said they are set to hold more raids in other parts of the country. In 2010, the Philippines’ PC software piracy rate stood at 69 percent, the fourth consecutive year that it stayed unchanged. The Business Software Alliance (BSA) pegged losses caused by software piracy in the Philippines at $278 million, a staggering amount from the $141.7 million recorded in 2007. With my wife and I now using laptops as primary workstations at home, we decided to use a Wi-Fi router to share our PLDT myDSL connection. The snaking network cables were threatening to trip us and our kids. 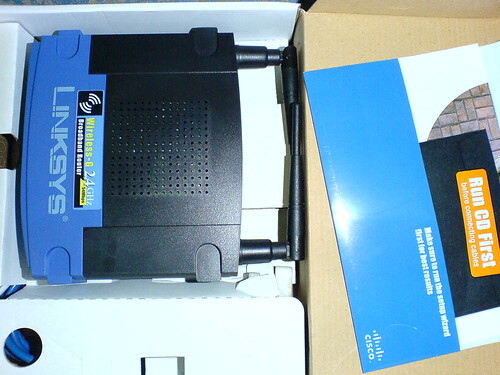 LINKSYS WRT54G. I used this Wi-Fi router to set up a wireless broadband connection at home. Click to enlarge image. In my case, it was “the sleep-deprived blogger who couldn’t with the little engine that could.” I did eventually set it up—and I’m now using it to publish this post while downloading tons of files—but only after I went Internet-deprived cold turkey, at home at least. It’s been four days since I’ve switched my main blogging tool, an MSI s260 laptop, into the beta version of the next Ubuntu release—Gutsy Gibbon or Ubuntu 7.10. This next version of Ubuntu is scheduled for release in the coming weeks but I couldn’t wait for the final version. I wanted it now. After the beta was released, I started preparing to upgrade. I downloaded a disk image of the installer via Bittorrent while backing up files in my laptop. Since there were many seeders, the download took less than two hours. RESTRICTED EXTRAS. 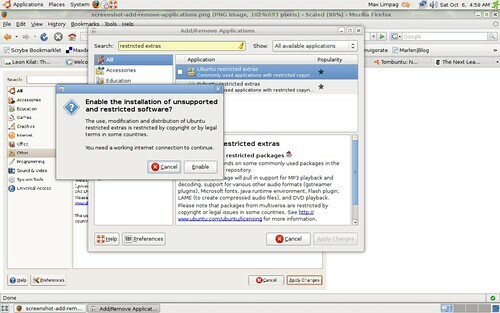 Among the packages in the repositories of the next Ubuntu Linux version is “restricted extras,” which comes with Microsoft fonts, MP3 playback support and the Flash plugin. Click on photo to enlarge. You can upgrade to Gutsy Gibbon from Feisty Fawn, the version prior to it. I chose to do a fresh install partly because I was reared in a Windows world and that’s how I installed new operating system versions—starting from scratch. The installation was easy and went without a hitch. The installer detected my built-in dial-up modem, which I haven’t used since I bought the laptop, and informed that “restricted drivers” were available for it. Beryl, the compositing window manager I’ve been using since I migrated to Ubuntu Linux in April, is now merging with the project it forked from, Compiz. The new project is called Compiz-Fusion and the initial work is great, a few notches above Beryl in some aspects. RING SWITCHER. Compiz-Fusion’s ring switcher is really a great and eye-catching way to switch between applications. 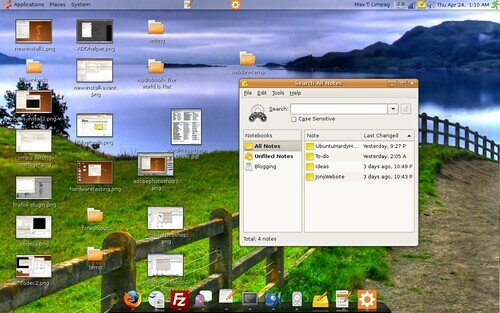 For more Compiz-Fusion features, check out my short video clip below. Click on photo to view larger image. 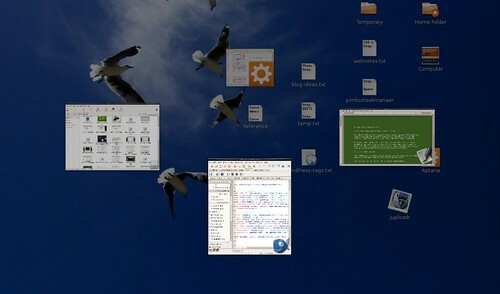 For a Linux newbie, discovering the extent of customization possible with the operating system is a productivity trap: you decide to tweak one part of your desktop and then you’d read about another cool software or tweak and so you decide to try it and the next thing you know, you’re spiraling in an endless trial of tweaks that you miss several project deadlines. I was determined to avoid that. After I installed Beryl and configured it to my liking, I made a pledge to limit customization of my desktop appearance to changing wallpapers and the configuration of my panels.